Cut the yellow croaker into small chunks. Marinade with soy sauce and wine for a day and let allow it drip dry. Fry the pieces until the sides are golden brown, then add a small cup of Jinhua douchi , a bowl of sweet wine, a small cup of autumn sauce, and boil together. When the sauce has reduced, add sugar, soy-sauce pickled cucumber and ginger , and continue to reduce slightly before plating. The flavours of this dish are deep, rich, and delicious. : Figuring out what type of fish was “Huang yu” (黃魚, lit. Yellow fish) took quite some time. The challenge came down to the fact that while there are many references to “yellow” fish in Chinese, there are no freshwater river fish known by the name. However, many clues point to the saltwater Yellow croaker (Larimichthy crocea) as being the most likely candidate for “Huang yu”. First, although Yellow croaker is a saltwater fish, it congregates in the brackish waters of the Yangtze delta and estuary in certain seasons. It is also fished year-round in the sea surrounding the delta and is, commonly now as before, shipped up the river to be sold in both its fresh and dried forms. Second, considering how the previous chapter’s title Haixian can mean “Delicacies from the sea” as much as “Delicacies from over-seas”, I am also willing to allow this chapter’s title Hexian to veer off to mean “Delicacies shipped in by river” although it should specifically mean “Delicacies from the river”. The yellow croaker fits in the former category. Third, the first recipe is remarkably similar to Hongshao yellow croaker (紅燒黄魚, lit. red-cooked yellow croaker) and its variant Douchi hongshao yellow croaker (豆豉紅燒黄花鱼) while the second recipe basically describes Yellow croaker soup (黄魚羹), both of which are well-loved preparations for the fish even now. I did consider Trachinotus blochii (金鯧, lit. golden pomfret) as a possible fish due to its common preparation with douchi is used with it, but it is really a light textured fish and contrary to the last sentence of the section’s text. But what finally settled this for me was actually a line in the Suixiju Gastronomic Manual (隨息居飲食譜) by a close contemporary of Yuan Mei, the Qing Dynasty Doctor Wang Shixiong (王士雄). In this document, he explicitely stated “Shishou fish is know as Huang fish, and also as Jiang fish” (石首魚一名黃魚，亦名江魚). What this line effectively links is the Sciaenidae or croaker fish family (石首魚科) with the term Huang yu (黃魚), making Huang yu a species of croaker and most likely the Yellow croaker. But even more interesting is the fact that the Huang yu is also known colloquially as Jiang yu (江魚) or the “(Yangtze) River fish”, which may explain why Yuan Mei placed it in this chapter of river delicacies despite the fact that it is not a freshwater river fish. All of these points indicate that the “Huang yu” referred by Yuan Mei is undoubtably Larimichthy crocea, more commonly known as the Yellow Croaker. : Douchi is a fermented black soybean that can be used directly to season food. It is only an intermediate product used make a very high quality soy sauce in Taiwan known as Yinyou (蔭油, lit. Shaded sauce). : I previously translated gua-jiang (瓜薑) as just “ginger”, thinking it was just another ginger variety. Turns out, it’s a rather common ingredient pair made of soy-sauce pickled cucumber and ginger. : The term here is chai (拆) means to tear and disassemble like taking meat off chicken to make chicken sandwich. I’m not sure if this is the best way to translate it. Grenadier anchovy is best when cooked in the manner of shad: seasoned with sweet wine lees and light soy sauce then placed on a plate and steamed. One does not need to add water in preparing the dish. If one dislikes having to deal with fish bones, use a sharp knife to fillet the fish, then pull out the bones with tweezers. Simmer these fillets in a mixture of ham, chicken, and bamboo shoot broth, and one gets a incredibly delicious soup. People in Nanjing do not wish to deal fish bones, so instead they bake the anchovies in oil until they are dried and shriveled and then pan-fry them more afterwards. There is an adage that goes: “Straighten a humpbacked person’s back and you’ll surely kill him”, which quite suitably describes this method for cooking Grenadier anchovy. Tao Datai from the city of Wuhu has another way of preparing this fish. 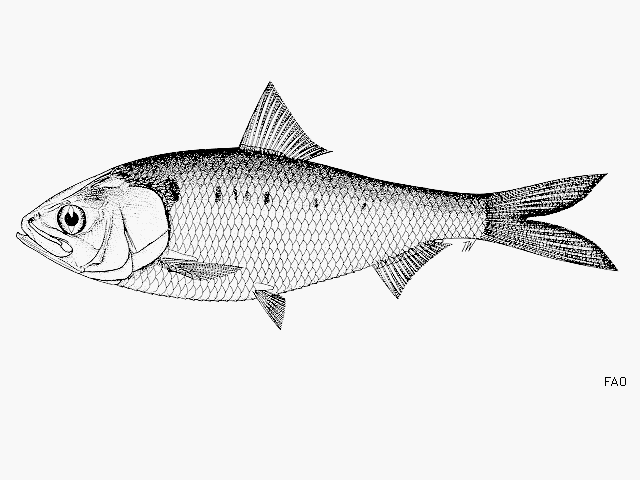 A sharp knife is used to obliquely slice down the back of each grenadier anchovy to sever their bones. They are then pan-fried until golden brown and seasoned with the proper condiments when done. One would be hard-pressed to feel any bones when eating anchovies prepared so. : A quick search of daoyu (刀魚, lit. knife fish) will reveal that the name used to refer to at least half a dozen types of fish. Many of them, like the popular Pacific saury (秋刀魚) or one of the many types of beltfish do not fit the bill here, not only because they are saltwater fish but also because they have bones that are far too thick and coarse to be “tamed” using the methods described here. As such, we have to assume that the fish described is actually the Coilia genus of anchovies that swim in the Yangtze River, either Coilia ectenes, also known as the Japanese grenadier anchovy, Coilia macrognathos, the Longjaw grenadier anchovy also known as the Yangtze dao fish 长江刀鱼, or Coilia mystus. 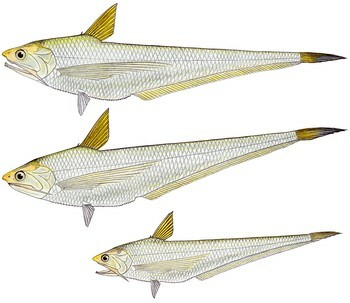 All three anchovies are also known as Phoenix tail fish (鳳尾魚) or simply as daoyu (刀魚). : In this section, we have “2 ways for preparing grenadier anchovies” and not 3, because this is mention only to make fun of people from Nanjing. Although mocked by Yuan Mei here, this preparation is actually quite similar to that of a rather tasty dish known as “congshao jiyu” (蔥燒鯽魚, lit. scallion braised crucian-carp), whose preparation involves first soaking the fish in vinegar, followed by a long deep-frying, then stewing in a vinegar sauce. The result of this preparation is fish that can be eaten like a think piece of Scottish shortbread, with its head, bones, flesh and all crumbling and melting in one’s mouth; the ultimate lazy diner’s fish dish. This should be available at any good Shanghai cuisine restaurant though one may have to order ahead of time. : I wonder if “regular” anchovies are any good cooked this way. Oysters grow with their shells stuck fast to rocks, making them particularly difficult to dislodge. After being shucked, they can be cooked as a thick soup  in the same manner of cockles and clams. Known also as “ghost eyes”, oysters can only be found in the two prefectures of Liqing and Fenghua and nowhere else. : Cooking oysters as a “geng” (thick soup) is one of my favorite ways of eating them. : I wonder why it also has this strange name. Perhaps it’s because boiled oyster plump up into an eyeball shape and looks weird enough to be ghost-like? To be honest, I don’t even know why this section is called “li huang” (蠣黃), which translates to “Oyster yellow”. I get the oyster part, but where does the yellow come from? : In Chinese cuisine, Oysters are found in both fresh and dried form. The former is common around coastal regions while the latter is available in most parts of China and in Chinese dried food stores (海味乾貨) all around the world. I don’t know why Yuan Mei states that oysters can only be found in the two prefectures when fact is it can grow anywhere. Perhaps Liqing and Fenghua were the only places in Qing dynasty that cultivated oysters? Whitebait are small dried fish from Ningpo. Their flavours are similar to dried shrimp and are very good in steamed egg. When prepared well they also make excellent side dishes. : Known as haiyan (海蝘) or “sea geckos”, which matches the visual description of these tiny translucent silvery speckled fish. Nowdays they are called haiting (海蜓), which translates as “sea dragonfly”. In any case, both sound way better than the unappetizing term “whitebait”. Truth be told, I was tempted to go with the Italian term for this food, “bianchetti”, since any thing with an Italian name seems to sounds sophisticated, exotic, and possibly delicious to the Western ear. Well, give it to the English to ruin yet another food by name. : Ningbo, a coastal city of Zhejiang. Renown for seafood in China and throughout Chinese history. : Only if they are small (~2-3mm in body width), the large kinds (>4mm) are better stir-fried to make side dishes or snacks for drinks. : I really like to eat these things, especially the tiny ones. All you have to do is stir-fry them dry and eat them with rice as a topping. Simply incredible. Problem is, eating fish fry and fishing them possibly one of the most destructive things on can do to a fish population and their local ecology. I mean, what better way is there to wipe-out a species by eating all its childern before they reach reproductive age? Given the state of our environment now, I can’t find it in me to go eat this anymore even though a part of me craves it. I bet this is how vegans feel sometime.